Ceruse originally referred to the ingredient also known as white lead. Mixed with vinegar, it formed a popular makeup used during the 1500s. 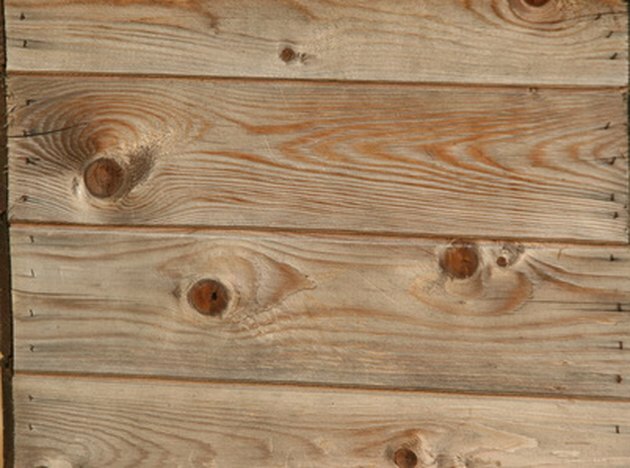 Also used in lead paint, ceruse has come to mean a finish for wood where an overlay of white fills and reveals grain lines while having little effect on the overall color of the wood's base color finish. Pickling is another term for the process of creating the look of aged wood that has lost its original coat of white paint over time or giving a soft, frosty patina to raw or stained wood. Upgrade the look of pine or oak with a whitewashing technique. Clean any foreign matter from surface of wood. Use wire brush, stroking with the grain of wood to open wood pores and raise grain. Use fine-grade sandpaper to smooth raised grain. Remove all sawdust and debris from wood with tack cloth. Prepare your chosen cerusing material in mixing container according to product directions, thinning paint, if used, with appropriate diluting material. Apply filler, wax, stain, thinned paint or glaze in a smooth, even coat with applicator such as brush or clean lint-free cloth. Work one section at a time, feathering edges and applying in the direction of the wood grain. Time the ceruse absorption carefully so that only the most-open grainlines absorb color. Wipe off evenly with the grain, using clean, lint-free cloths. Allow ceruse finish to dry completely. Brush on a topcoat of polyurethane, varnish, shellac or sealer and allow it to dry. Apply a second coat of your chosen sealer and let it dry. Sand lightly. Continue this process until you have achieved the desired protection for your ceruse-finished wood.